In today’s workplace, the changes affecting supervisors and managers are almost overwhelming. As organizations restructure, their span of control and demands on their time increase, and relinquishing control in some areas becomes necessary. However, after years of giving and receiving work direction, managers and employees are not always comfortable with this shift. Increasing the comfort level for taking the risk entailed in taking and supporting initiative requires a two-step approach: (1) Acquiring coaching skills so that managers can discuss potential, appropriate opportunities for taking initiative and (2) acquiring feedback skills so that managers reinforce actions in a way which builds confidence and encourages future actions. Supporting Initiative builds awareness and skills in both steps. First, participants follow a simple coaching model to get employees involved in making decisions and analyzing risks. Coaching employees to explore alternative solutions is essential to creating a participative work environment. Helping employees analyze the consequences of an action is important if decision?making is to move down to the front line in an organization. Both employees and managers feel more confident using the specific tools provided in Supporting Initiative. Second, participants learn techniques for acknowledging employee initiative. To help employees gain confidence and feel it’s truly OK to make decisions within certain parameters, managers must reinforce employees’ actions. Managers learn the importance of giving positive feedback when an employee takes initiative. It’s easy to do this when results of the initiative taken were positive. In Supporting Initiative managers practice a positive feedback model that allows for a realistic look at what happened and what might work better in the future, in the event results were not positive. 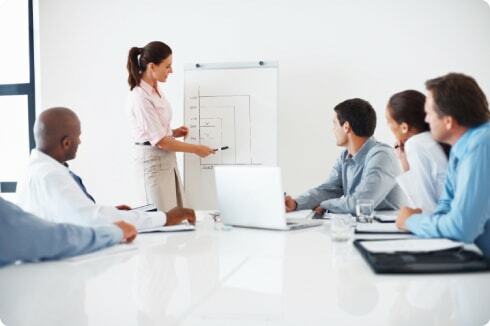 Ongoing coaching to support initiative, and acknowledging initiative in a positive, constructive way, helps managers create the participative environment that encourages employees to take the risk that initiative requires. Role plays and action plans facilitate the use of these new skills back on the job. By feeling confident that they’re giving employees the skills and guidance necessary for appropriate risk-taking, managers reduce their own resistance to relinquishing control.